Published: Sept. 10, 2018 at 09:23 p.m.
New York jets quarterback Sam Darnold notches his second career touchdown pass thanks to a strong effort from wide receiver Quincy Enunwa, who fights off a Detroit Lions defender to hit the end zone. Published: Jan. 1, 2017 at 01:47 p.m.
New York Jets quarterback Ryan Fitzpatrick throws a deep pass to wide receiver Quincy Enunwa for 51 yards. Published: Nov. 27, 2016 at 05:09 p.m.
New York Jets wide receiver Quincy Enunwa hauls in a 40-yard reception. 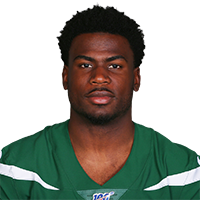 Published: Oct. 31, 2016 at 12:21 p.m.
New York Jets QB Ryan Fitzpatrick finds wide receiver Quincy Enunwa for a 24-yard TD.